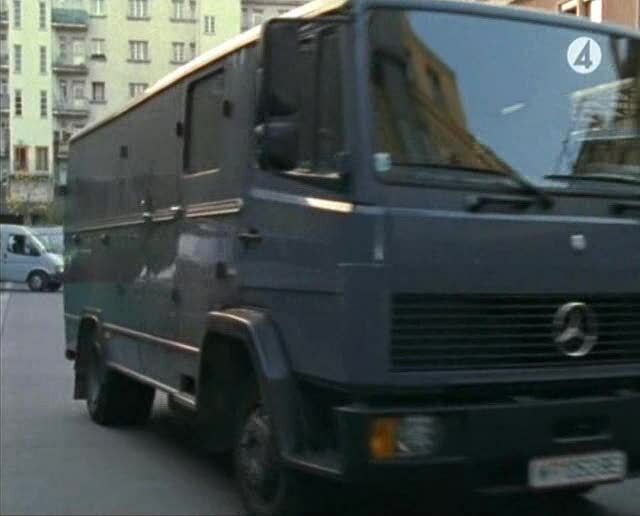 IMCDb.org: 1991 Mercedes-Benz 709 Leichentransporter KAROS [LK] in "Kommissar Rex, 1994-2017"
Only by accident I discovered this truck. Without any doubt, this is the successor to /vehicle_129524-Mercedes-Benz-LP-809-Bestattungswagen-LP-7,5t.html and therefore a Mercedes Benz 709 funeral car (!) which was built by KAROS GmbH of Vienna. I have several pictures of the KAROS LN2 in my archives, but sorrily I´m not allowed to show them here. As I stated, I have pictures (and scanned vehicle registration document) of an identical truck to the one shown here, but the person who sent them (former owner) does not allow to use them on any website - that´s why I can´t show them via imageshack. Registration document reads clearly KAROS GmbH as the manufacturer and "Spezialkraftwagen (Leichentransporter)" as classification. Same body, same colour, same base vehicle, manufactured in 1991. You can trust me, this is 100% sure. There's a picture in the gallery on your website, isn't it? Tönz wrote There's a picture in the gallery on your website, isn't it? Correct! Long time, no update in the pictures section - I didn´t know any more that I already have one of them online. That´s also a similar vehicle, equally built by KAROS (but not the one I´m talking about). Anyway, we can also use http://www.bestattungswagen-literaturarchiv.de/mediac/400_0/media/Karos~MB~809.jpg as a reference. KAROS later made some Atego based ones, before they handed this field totally to Dlouhy. Thanks, Tönz. My pleasure... by the way: that's a brilliant site you are running. I'm a regular visitor for many years now and I'm pleased about you supporting IMCDb with your expert knowledge. Yes, your Bestattungswagen-page is great and very informative. Many thanks! A propos: @animatronixx: do you know, that the company Bleker in Borken (mainly a Citroen-dealer) also produces hearses? They have a seperate garage for chassis-work. There they make special bodies for several cars, not only Citroen. I've seen it, when I brought my K 70-seats to the upholstery-workshop, which belong to that company, too. Thanks a lot, Tönz & Ingo! I´m glad you like it. Well, I came here for three reasons: I like to share my knowledge, I like to enlarge the same (and already have learned a lot here!) and I like old cars as well as old movies. So there´s no better combination and I´m really digging this site. And it seems like I´m currently learning more: No, I never ever heard of Bleker. Could it be they were responsible for the early Kuhlmann Cars products (CX Break, XM Break, elongated Jumpy etc.)? Do you know which kind of cars they might have converted to funeral use? Anyway, I just opened a new section in my database for hearse coachbuilder No. 762 "Autohaus Bleker GmbH". @Animatronixx: when I've been there (ca.1 year ago), I've seen that they were working at Mercedes Vito, Sprinter and E-Class T-model, also VW T5. Not all of them were hearses, they also made cars with office-interior or for handicapped-transportation. Obviously they aren't fixed on special cars or brands. The guy in the upholstery-workshop also restores or tunes up seats for all kind of cars, not only Citroen. Thanks, Ingo. I really suppose they´re related to Kuhlmann Cars in some way. For they´re obviously not known as a manufacturer, it´s quite possible they build to KC´s order. Next time I pay them a visit I´ll ask for some details. This afternoon I saw a outcasted hearse in private use. It was based on a Peugeot 505. Ingo wrote This afternoon I saw a outcasted hearse in private use. It was based on a Peugeot 505. 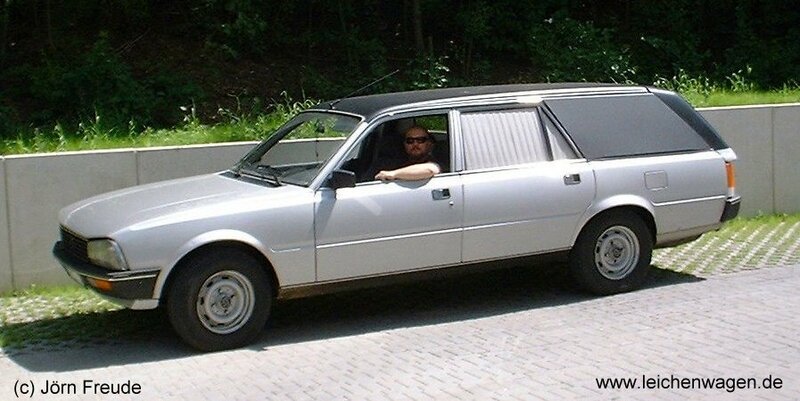 Yes, there were many of these since Stolle did a number of Peugeot 505 funeral cars through the years (several body variations). Here is one with minor body modifications: http://www.leichenwagen.de/bilder/Peugeot1.jpg There were also a couple of high roof versions etc. German "Schwarzfahrer" don´t appreciate them too much, because they´re not much more than slightly modified station wagons.